Anand : First of all, I would like to thank Ajay for taking the time out from his schedule to share his views on various aspects of software testing with us. Ajay is an inspiration to many people in the software testing world. With his dedication to the craft and passion for the learning and sharing, he has helped many testers around the world. Ajay has presented in many conferences around the world including a keynote at CAST 2015. We are honoured and privileged to have Ajay with us today. Anand: Thank you for taking the time to talk to us Ajay, Appreciate. To start with, tell us something about yourself. Ajay: Hello, I am Ajay and a software tester. I have spent my last eleven years learning about software testing, problem solving and how to think well. I like to meet software testers and understand their perspective of software testing. I blog at www.enjoytesting.blogspot.com and tweet as @ajay184f. Anand: When did you start your career in software testing? Was it something that just happened or did you choose software testing as a career? Ajay: I was offered the position of Associate QA Engineer at my first job. I liked the subject Total Quality Management in my engineering degree and the passion seems to have helped me get the job of a software tester. Even after the interview, I did not know what is software testing. I did not want to take up another offer for the fear of being asked to program. After the initial software testing training at my job, I had more questions than answers. Maybe, that is when the software tester inside me was born. Anand: When did you become seriously passionate about software testing? How did that happen? Was there any trigger? Ajay: As I had many questions, I started searching for answers. I wanted to be the best software tester. When I searched for “How to become the best software tester?? ?, one of the Google search results was the video by James Bach: Becoming a software testing expert. Another important trigger was an email sent by my colleague about a testing workshop by Pradeep Soundararajan. I attended that workshop and that led me to discover the beautiful world of software testing and how the testing community is alive and learning all the time. Anand: How do you know if a tester is not passionate or engaged with the craft? What are the signs? Do they invest in their learning or wait for the company to sponsor their learning. It is not always the money but the motivation to spend time in self-learning. For example, Srinivas Kadiyala spends time outside his office hours to learn about software testing. Check out his blog. How does one practice software testing? Are they proud of their work? Anand: When you look at your journey so far, what makes you feel good and satisfied? Ajay: I got an opportunity to learn from many thought leaders as part of the workshops, testing meetups and conferences all around the world. That makes me happy and feel lucky to be associated with the thought leaders. 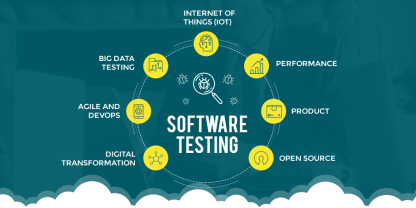 Many testers are unaware that there is an active community which thinks and works on software testing apart from their day to day office activities. I have experienced multiple conferences like CAST, EuroSTAR, Agile Testing Days, Mobile App Europe, VISTACon, STePINSummit, Unicom’s WCNGT, Think Test, QAI Conference. Also, the experiences at workshops like Problem Solving Leadership, Rapid Testing Intensive, Rapid Software Testing are going to help me for a long time. Anand: Tell us something about the books you have read related to software testing. Which books would you recommend and why? Then, I was introduced to the world of Jerry Weinberg’s books like Perfect Software and Other Illusions about Software Testing, Are your lights on? Then, you start picking up books specific to the problem you are facing right now at your workplace. I loved the book on Mobile app testing by Jonathan Kohl when I was testing mobile apps. Anand: What are your views on different styles of testing such as scripted, exploratory, in an agile context, and so on? What is your style? Ajay: As long as the customer is happy, I am happy to follow any style. Personally, I prefer exploratory testing approach. I believe that a skilled tester can adapt to any style especially agile contexts where there is constant change and feedback loops. Anand: What is the biggest contribution a tester can make in a project? Ajay: Our role as testers is to gather information to the management about the quality of the product, project and the testing efforts. I love talking to as many stakeholders as possible, understanding everyone’s expectations and alerting any discrepancies. A tester’s biggest (one of the biggest) contribution would be to understand that things can be different than what it appears to be. A tester should be able to sniff out problems and be courageous enough to share it with the stakeholders. Anand: What changes have you noticed in the role of a tester? How is it evolving? 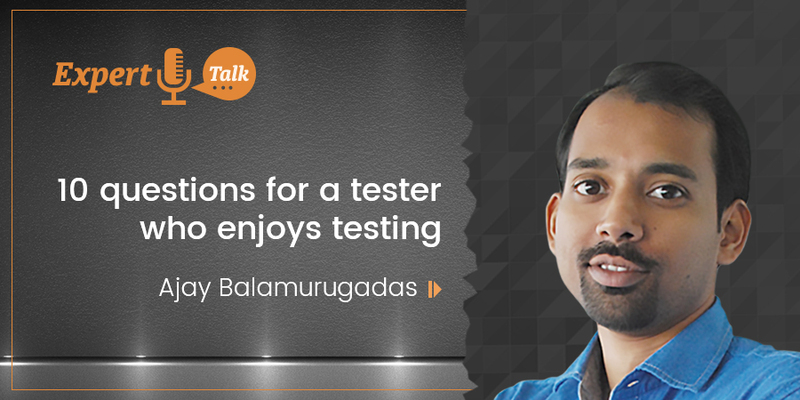 Ajay: When I started as a tester, it was considered as the last line of defence and testers were blamed for any bugs in production. Slowly, they were involved in meetings where developers discussed the product design and were encouraged to understand the underlying technology. Now the testers are slowly asked to come out of the silos and be involved right from the start. Even with all these changes, one thing remains constant and I like that. The testers need to be constantly working on their skills. The testers should understand that testing is their core skill and irrespective of the context they are in, skills like questioning, critical thinking, observation, manipulation, resourcing are always in demand. Anand: Do you have any advice for the people who are still discovering if testing is for them or not? Ajay: Anyone can test. To test well, you need to work on your skills. So find out if you are ready to put in the long hours to hone your skills. The journey to become a skilled tester is never ending and interesting at the same time. Testing doesn’t mean no coding. It doesn’t mean working alone. Read the blog posts by testers all over the world – https://www.ministryoftesting.com/testing-feeds/ and see if it interests you. Talk to the testers from the community on Twitter, Skype and clarify your doubts. Anand: Thank you, Ajay, for sharing your views with us. 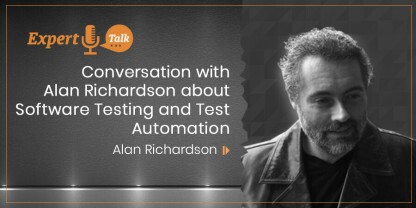 Your insight and work on software testing have helped many testers around the world. We hope that you will continue to contribute to this community of software testers and help it move forward. Once again, sincere thanks for taking the time out to share your views with us. To our readers, if you like the views and insights shared by Ajay, please share it in your network on Linked-In, Facebook, or Twitter.